I’m a total bandwagon Flyers fan– meaning not exactly that I only root for them when they win– even during the playoffs, I would rather have watched Sergei Bobrovsky lose than Brian Boucher win (almost– bad example; Boucher is the journeyman folk hero even Flyer haters can enjoy rooting for)– but that I only root for them, explicitly, when they’re exciting to watch. So I was rooting for them halfheartedly this postseason, not expecting much– I went with Buffalo in six for the opening round, more optimistically as it turned out with Boston in six the next round— enjoying Bobrovsky’s brief blown shot at being a playoff savior, or van Riemsdyk’s breakout (as of Friday night, he led the NHL with 70 shots in 11 games, a whopping 22 more than runnerup Daniel Sedin), or the 54 shot outburst in Game Two of the Boston series– but I wasn’t exactly excited. The Bruins deserved to win. Thomas deserves it. Lucic, Krejci, Chara deserve it. 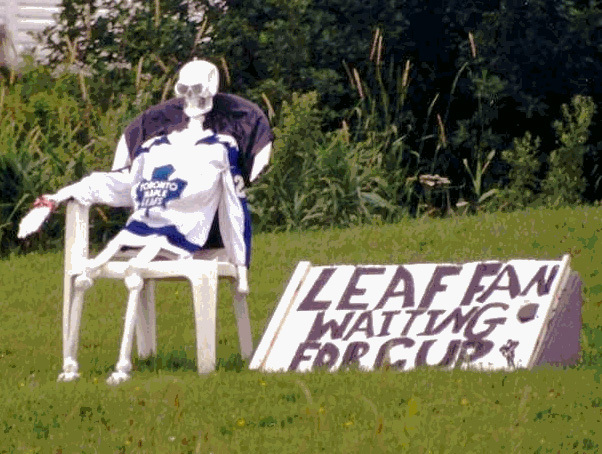 Twelve seasons as a Leaf? Kaberle deserves it. The Bruins haven’t won the Cup since 1972. The only current Bruin who was alive in 1972 was Mark Recchi, and he’s undead. Buffalo has never won a Cup in 40 years of existence. Vancouver has never won a Cup in 40 years of existence. San Jose has never won a Cup in 20 years of existence– or since Logan Couture was two years old. Nashville has never won a Cup in 14 years of existence. Washington has never won a Cup in 37 years of existence, and won’t this season either. Odd to consider, but among the surviving teams after Round One, the only two teams who’ve won a Cup more recently than the Flyers are Detroit and Tampa Bay. Of course, who’s won what when is irrelevant, to a true believer. Red Wings fans weren’t any less crushed by the Game Seven loss to the Penguins in 2009 because of 2008 (or 2002, or 1998, or 1997). Islanders fans weren’t rooting for Edmonton in 1984. Montreal Canadiens fans weren’t rooting for the North Stars in 1980. Which is exactly my point. I hated the Blackhawks winning the Cup last season, but that was as much me as a Canucks fan as me as a Flyers fan (and because Patrick Kane is an obnoxious punk and an out-of-touch enemy of working people), and despite that I still enjoyed watching Toews, Byfuglien, and ex-Flyer Ben Eager. I’m more of a hockey fan than a Canucks fan or Flyers fan– I think. But out here in Oaklyn, New Jersey, twenty minutes from the Wells Fargo Center and the ghosts of the old Spectrum, someone was awake at 1:30 a.m. Eastern Time when Burrows scored in overtime of Game Seven, and scared at least one of my cats applauding. So I do want the Canucks to win the Cup– at least one Cup, at least in 2011– but I don’t want the Flyers not to win the Cup next season, or some season in the near future, and preferably against a team I hate (welcome back, Patrick Kane), or at least am neutral towards (the Ducks? Nashville? Columbus?). At worst, I want them not to be boring. I still won’t bleed orange and black, but I want to see good hockey and who else have I got to watch? This entry was posted on May 8, 2011 at 6:55 pm and is filed under Canucks-related, Flyers-related. You can follow any responses to this entry through the RSS 2.0 feed. You can leave a response, or trackback from your own site.